Yellow Gold Conch Ear Piercing ring with hinged fastening for easy fitting, made out of stunning 9 Carat or14 Carat Yellow Gold. 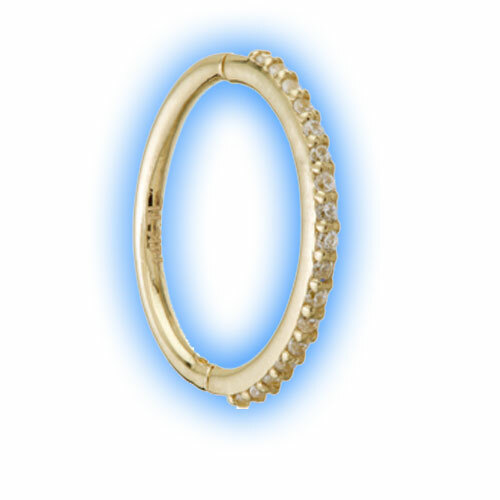 This is an Eternity Conch ring featuring 17 x 1mm Clear CZ crystals that look amazing. This ring is 1.2mm (16g) by 12mm (1/2") and looks stunning when worn in a conch ear piercing. "The last twice I have ordered the site has allowed my order to go through even though the items have not been in stock, so I have only found out..."
"Great Item - Quick delivery - all you can ask for really"